“This book takes 'page-turner' to a whole new level." "Ferencik pushes her characters to the edge in a starkly beautiful and unforgiving wilderness, where their worst nightmares become all too real. 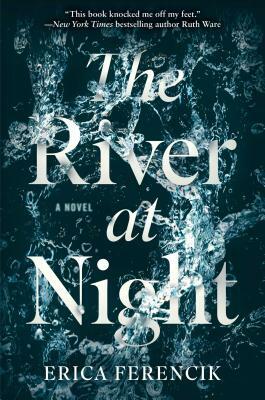 A harrowing, devastating, and superbly written thriller, The River at Night grabbed hold of me and didn't let go until the final, perfect sentence." "Ferencik's debut novel is a must-read for anyone who loves high intensity thrillers. Her use of foreshadowing and flair for suspense is impeccable; it sets the stage for a terrifying few days in the wilderness of northern Maine. Rich imagery and attention to detail are just a few of the reasons why Ferencik is one of the best new thriller writers out there!" "[A] heart-pounding debut novel... A ripsnorting survival tale bolstered by Ferencik's writing, which captures both the beauty and danger of the wild." “Ferencik, no stranger to creating an effective blend of dread and horror… continually surprises with as many plot twists and turns as the titular river itself… This is a novel that will burrow in your memory well after its conclusion." “Surprising, exhilarating and suspenseful, it’s a treacherous, rapid thrill-ride."